Rustom is the highest Akshay Kumar grosser worldwide with net collection of 220.75 crore approx . First Day was 13.92 cr. & Opening Weekend Was 49.53 cr. First Week Total :- 89.32 cr. Total india net Collection Till now 120.11 cr. worldwide net collection of 220.75 cr. 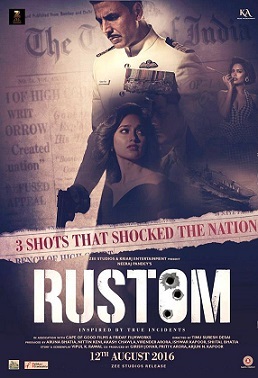 Rustom is a 2016 Indian crime thriller film written by Vipul K Rawal, directed by Tinu Suresh Desai and produced by Neeraj Pandey. It features Akshay Kumar, Ileana D'Cruz ,Arjun Bajwa and Esha Gupta in the lead roles. The film is based on the real life incident of Naval Officer K.M Nanavati and businessman Prem Ahuja.